Quepoa Expeditions is a smaller personalized whitewater river rafting company based out of Quepos, Costa Rica, just minutes from the world famous Manuel Antonio National Park and its spectacular beaches. 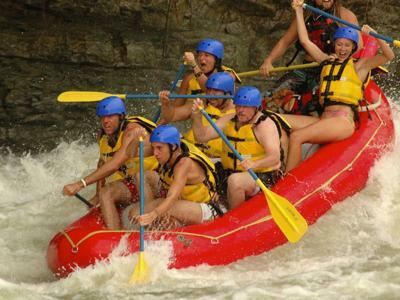 We are the top ranked rafting company in Manuel Antonio on Trip Advisor. Since 1996 I have been professionally guiding river trips throughout the United States, Costa Rica, and Europe. From the Class V Gualey River in West Virginia, the Upper Animas in Colorado to the Fuime Noche in the Italian Alps. I have been exploring the rivers of Costa Rica since 1999. These tropical rivers have captured my heart and soul, and operating this adventure company is the dream of a lifetime. I think you will have the time of your life running one of our magical rivers and I look forward to sharing the little piece of paradise I have found with you. Rainy Season is Rafting Season! The Rio Savegre is running at a great level right now, with huge roller coaster type waves, great spots to jump out and swim, and incredible waterfalls to explore. For a slightly shorter trip closer to town, you can try the Rio Naranjo. There you will find faster moving, more continuous, and technical rapids. Travel deep into the rainforest for a full day adventure on one of the cleanest rivers in Central America. This trip includes a short hike to some of the most spectacular waterfalls in the area. In the rainy season (May thru December), you will encounter big-water Class III rapids with roller coaster type waves. In the dry season, (May thru December) you can raft with a guide, or challenge the rapids one on one in your own inflatable kayak (ducky). Expert guides will be there to help you navigate the rapids. During the rainy season (May thru December) this is the most challenging whitewater in the area. 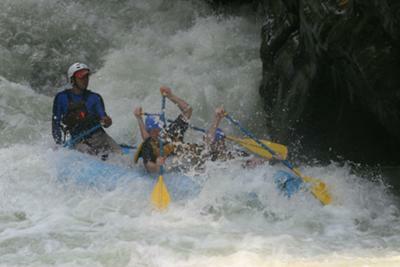 Charge through continous Class III and Class IV rapids with the best guides in the area. During the dry season (December thru May) the sparkling green water carves channels past huge boulders, and it is a great inflatable kayak run. Take out is only 10 minutes from Quepos. Trips depart 8am and 1pm. This beautiful canyon is only 40 minutes north of Quepos, and is reccomended for the more adventurous. Paddle you own ducky over 10 steep, technical, Class III rapids with assistance of expert kayakers. Explore beautiful waterfalls and the crystal clear water exclusively with Quepoa Expeditions. 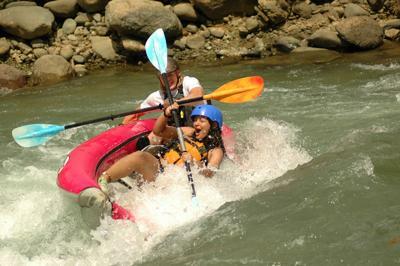 The only class IV/V rafting available during the dry season (December-May). Located just outside of Quepos in a spectacular wilderness canyon. 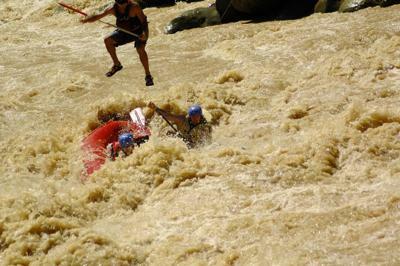 Tight and technical rapids with steep drops. Previous rafting experience recommended. All prices include transportation from within the Quepos/Manuel Antonio area. Transportation from Jaco/Herradura costs an additional $20 per peson.